Having already delved into the highest scoring half statistics and markets, we decided to recalibrate our analytical powers to take aim at another of the bookmakers’ relatively underutilized half time offerings. This time we will be focusing on the “half time result” market, where punters try to forecast the result of a particular fixture at the 45-minute interval (W/D/L). Naturally, depending on the fixture and the strength of each team involved, the odds for each half time outcome will vary. For example, in Manchester City’s Premier League game at home to Burnley on October 20th, the odds on City to be winning at half time are around 3/10, while Burnley are priced as long as 18/1 to hold a half time lead. The fixture from the same date between Newcastle Untied and Brighton looks a much more even match up and the half time result odds reflect that. You can get around 2/1 for Newcastle to be leading after 45 minutes and 3/1 on Brighton to be ahead at the same juncture. Odds vary depending on the fixture you look at; however, our research shows that the middle option of the three half time result options, the draw, represents your biggest chance of winning. We start our analysis with a look at the half time results figures from the Premier League. Immediately, the draw totals leap off the screen. 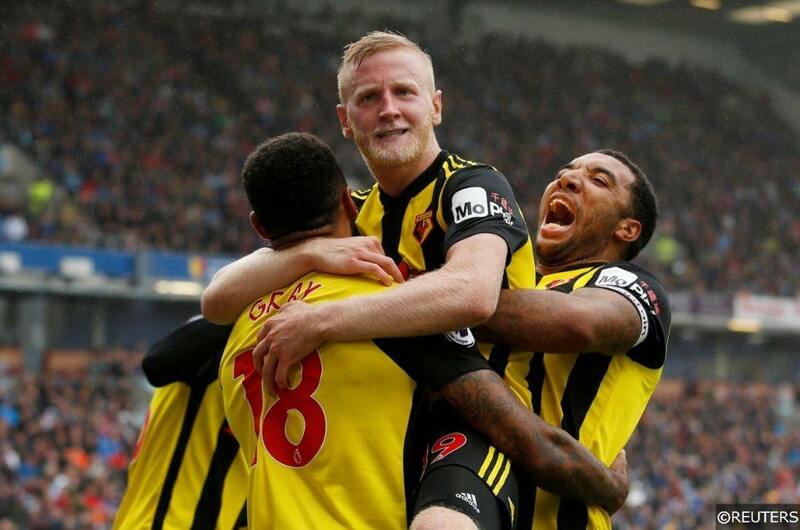 A staggering 42.5% of all 80 Premier League fixtures played in the 2018/19 season so far were level at half time. Home teams were winning at half time a full 10% less often, while away teams were winning at half time in just 1 out of every 4 Premier League fixtures. In England’s lower divisions, the drawing at half time trend continues with impressive consistency. In the Championship over half (51%) of the 144 matches contested this season were level at half time. A huge 38% of those 73 draws were 0-0 stalemates at the half time interval. The Championship’s 51% drawing at half time figure dwarfs the corresponding home team winning and away team winning at half time statistics, which marks the division out as one to keep an eye on. In League One, 45% of the 142 matches played this season were level at half time. 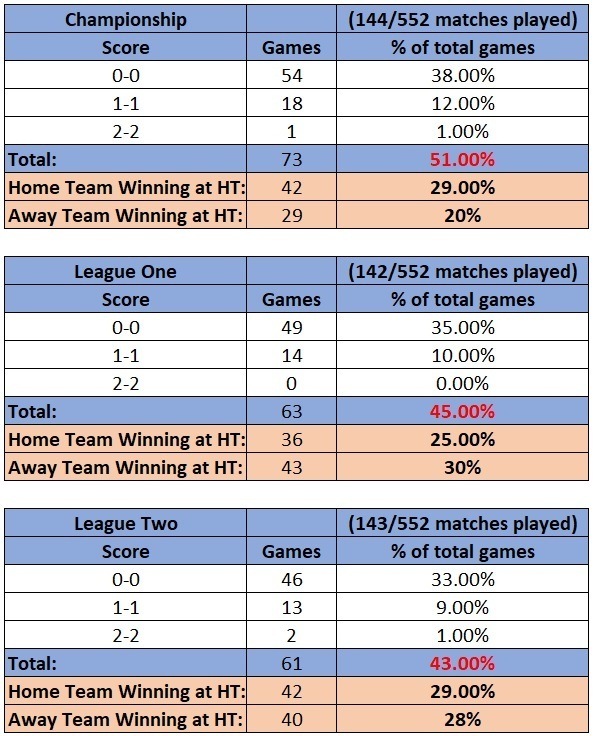 Incredibly, away teams were winning more often at half time (30%) than home teams (25%) in League One so far this season, which could open up some interesting “half time double chance” avenues that are worth exploring. 43% of the 143 fixtures played in League Two this season were also level at the half time break, though home teams (29%) had a slight upper hand on the away side (28%) in that division at the same point in the game. Spain’s La Liga had the highest half time draw percentage of all the league’s we analysed. 53% of the 79 La Liga fixtures played so far in 2018/19 were level at half time. Interestingly, the home team lead at half time in just 17 of those 79 Spanish top-flight matches. That means, in total, the home team failed to hold a half time lead in 78% of all matches played in La Liga this season. If that figure doesn’t make you want to jump head first into the “half time double chance” La Liga markets, then nothing will. Italy’s Serie A is the first competition to have a higher home team winning at half time percentage than the corresponding draw at half time figure. The home team were in front at the break in 43% of the 79 Serie A matches contested so far in 2018/19. 41% of those fixtures were level after 45 minutes, though the most interesting statistic is the away team winning at half time total. The away team lead at half time in just 16% of the 79 Serie A games played since the summer. Ligue 1 puts on right back on track, with 41% of the 90 games played in the competition to date in 2018/19 coming in level at the half time interval. 29 of those 37 half time draws were 0-0 at the break. The percentage gap between the home team (29%) and away team winning (24%) at half time in Ligue 1 is noticeably small. With the home team failing to secure a half time lead in 65% of Ligue 1 matches this season, the league is another competition to keep an eye on for some “half time double chance” action. The Bundesliga is the second league after Serie A to have a home team winning at half time percentage that’s higher than the equivalent half time draw number. In total, just 2 of the 8 leagues we analysed share that pattern. The home team has gone into the break with a lead in 27 of the 63 Bundesliga fixtures played this season. That 43% figure is the joint highest in that metric alongside Serie A’s corresponding figure. Our research shows that there are plenty of positive statistics to work with when betting in the half time result markets. 6 of the 8 leagues we analysed produced a higher percentage of half time draws than any other half time outcome. La Liga ranked highest with 53% of their matches level at half time, ahead of the Championship with 51% and League One with 45%. On average, 44.18% of the total combined games from the 8 different leagues we scrutinised were level at half time. That’s an incredibly high figure and a useful stat to be armed with when assessing the half time scores and results markets. Categories: Betting Strategy and Blog. Tags: betting advice, betting strategy, betting tips, and half time result. League: England Championship, England League 1, England League 2, England Premier League, French Ligue 1, German Bundesliga, Italian Serie A, and Spanish La Liga. Sports: Football.